Judy Blume will be speaking at the University of Hartford on June 21st as a fundraiser for The Mark Twain House & Museum. I’ll be interviewing her onstage and taking tons of audience questions. In preparation, I will be reading her complete works and blogging about the experience. Get your tickets here. I LOVE this book. Maybe because I read it in the back of my parents' minivan when I was fifteen on the way to summer vacation, blushing. 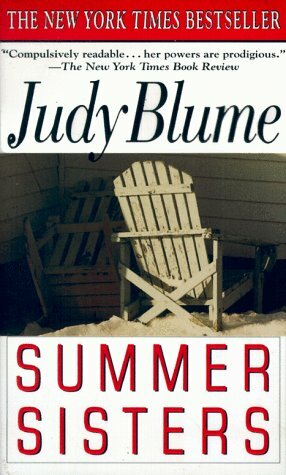 This is the only book of Judy Blume's that covers many decades of one life (in this case, actually, two). It's about two girls who spend the summers together on Martha's Vineyard from 1977 through 1995. Caitlin and Vix have one of those incredibly intense friendships that seem like a crazy dream once they're over. Those friendships, in a way, can feel almost closer than a family bond. Someone has chosen you, plucked you from your ordinary life and brought you entirely into a magical land of adventures and romance. I had a summer friend whose parents had a house next to a pond, right down the path from my grandparents. We weren't as close as the characters here but we had a tacit agreement to be friends during the time we were together. We hung out on the beach and wandered in the woods. We had dinner at each others' houses and hung around in our bathing suits. That friendship began to unravel in a very specific moment. A new girl appeared on the block and we all lounged in the cold pond-water together. She was older than us-- clearly-- and skeptically asked our ages, deciding whether or no we were too young to entertain her. My summer friend immediately lied about her age. I remember looking at her, feeling betrayed. I was not a liar and I definitely wasn't sixteen yet, and couldn't even pretend. Sixteen was a faraway land where I had no business trespassing. From that point on I didn't really spend much time with my friend any more. It was the classic drift-apart. Sometimes I'd see her through the trees headed down to the water. She wore bikinis now. I still wore one-pieces. That said it all. I've had many friends like Caitlin, the free spirit in this book, wild and self-destructive. And I've had many like Vix, reserved and reasonable. I'm really neither. Probably, most women exist somewhere in between and enjoy seeing those two types hash it out. Read this book as a teenager-- as I first did-- and it seems like a promise of a thrilling life. Read it as an adult-- as I just did-- and it seems like a memory. Either way, it belongs on the beach, free from the responsibility of being "literature." It's a good story. That's all I need to know.